> Eataly is jam-packed with people and Italian food-goods. There is everything from wine and cheese pairings to il pesce (fish) and la verdure (emphasis on produce). There is a beer garden, a panini stop, a pastry counter, and a coffee shop. You can purchase pastas, meat, bread, fish, cheese, liquor, produce, snacks, and desserts. After tasting some wine and cheese (we were a quartet of mother-daughter duos), we headed over to dine on Eataly’s homemade Neapolitan-style pizza and homemade lasagna. 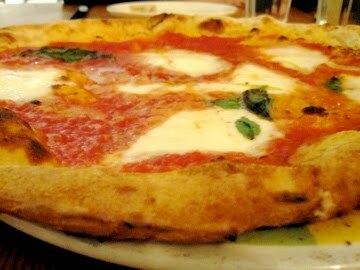 On the website, Eataly’s pizza is described as having a charred and elastic crust. I think that is a fitting description. The pizza we ordered was extremely simple; it had San Marzano tomatoes, fresh mozzarella, olive oil, and a about 2 basil leaves on top. Is it possible that the simple was almost too simple? Ok ok, the pizza was good. But I have definitely had better. And it sure took a long time to bring out this “simple” pizza. We also shared a lasagna (“pasta al forno con zucca”) with homemade noodles. It had pumpkin, butternut squash, and Pecorino cheese. This was quite good. It did sort of fall apart when you took a bite, but I liked the flavor and the creamy texture.